The term used for cloning by the group is "reprogramming" fibroblasts using somatic cell nuclear transplantation. However, there's no longer an attempt by the authors or members of the scientific press to create a new "unfertilized blastocyst" or pre-embryo: the embryos are called embryos, morula, and blastocysts. In recognition that these are not quite the same as embryonic stem cells derived from embryos produced by direct fertilization, the stem cells derived from the cloned blastocysts are designated as "Nuclear Transfer Embryonic Stem Cells" or NT-ESC. Tachibana's group obtained well over a 100 oocytes from women who underwent ovarian stimulation and transvaginal retrieval. The growth of four embryos to the blastocyst stage resulted in NT-ESC, after differentiation into a blastocyst with a trophoblast (precursor of the placenta) and the inner cell mass (the part that will develop into the actual body of the human). These embryos were destroyed to harvest the ICM. The report details years of research to find the optimum technique for cloning human embryos. It was found that the mitotic stage of the oocytes, MII, is critical. The researchers further developed a protocol utilizing caffeine and electrical stimulation to induce activation of the fused nucleus from the skin cell and donor oocyte. In addition, the authors found that "higher quality oocytes," those more likely to form viable embryos, resulted when the ovarian stimulation yielded fewer than ten oocytes. If larger numbers of oocytes were produced due to the ovarian stimulation, somatic cell nuclear transfer was less likely. In fact, the first four clones that developed far enough to produce NT-ESC came from one woman who donated eight oocytes in one cycle, resulting in the production of five cloned embryos. "In the context of generating patient-specific pluripotent stem cells, reproducible results with various patient-derived somatic cells and with different egg donors are a necessity." Although the donation is called voluntary and anonymous, the women were compensated for their "time, effort, discomfort, and inconvenience associated with the donation process." I can't help but wonder about how long the anonymity will last for the one woman whose oocytes yielded those first four successful clones and NT-ESCs or for the two women whose oocytes yielded the clones confirming the reproducibility of their method, in the second stage of the research. Or how much pressure they will face to continue to donate "voluntarily." The lack of concern for the women involved is revealed in this interview with the authors at The Scientist. "I was worried that we might need a couple of thousand eggs to make all these optimizations, to find that winning combination. But it actually took just 128 [eggs], which is a surprisingly low number to make 6 [hESC] lines." The primary objection is that 100% of the human embryos were created in harm's way and must be destroyed to harvest the NT-ESCs. These embryos are delayed human twins, artificially induced. Although the first cell of these embryos began in the lab, as the result of highly technical and involved procedures, they are human embryos and near-identical twins of the somatic cell nucleus. There is indirect acknowledgement that the embryos are twins of the donor of the fibroblasts by the reporting that tests of the chromosomes of the cloned embryos show that the DNA matches that of the donor of the fibroblasts, a patient with Leigh's syndrome. The sources of fibroblast nuclei raise other ethical dilemmas. The first research was carried out using female fetal fibroblasts. Later research involved creating human embryos with Leigh's syndrome. Leigh's syndrome results from a genetic defect of the mitochondria, the cell "power plant," which is inherited from the mother and only found in the cell cytoplasm, not the nucleus. Reports are already ignoring the fact that the donor's twins were produced with the express intention of destroying them for their inner cell mass. At least one is predicting that this is a technique which can be used to create future children for mothers who have the abnormal mitochondria. 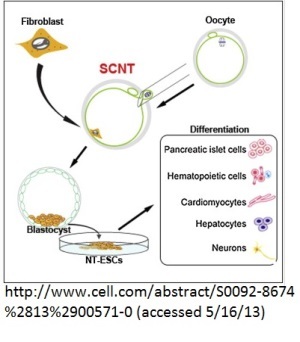 The report, Tachibana et al., "Human Embryonic Stem Cells Derived by Somatic Cell Nuclear Transfer," Cell (2013), is available on-line and in PDF.